If you are ever in Singapore, you should visit Sentosa, a resort island off the southern shores of Singapore and popular destination with both locals and tourists looking for Singapore beach getaways. With its beautiful white sandy beaches, lush tropical fauna and flora, and many attractions; there is almost everything to suit the young and the restless, as well as individuals and families: for nature lovers, sports enthusiasts, movie goers, and people just wanting to have a good time. Getting to Sentosa is not difficult at all; visitors have the option to travel by car, taxi, MRT (Mass Rapid Transport), get on a direct bus or enjoy a bird’s eye view from a cable car ride from HarbourFront to Sentosa. It is also possible to walk from HabourFront VivoCity to Sentosa. Entrance fees into Sentosa are $1, however, if you are going by cable car the entrance fees are included. Once you enter Sentosa, you can visit any one of the attractions that catch your fancy. The transport system (of buses and trams) on the island is efficient; making it is easy to navigate your way around, most of the popular attractions are also within walking distance and easy to find as they are near each other. Food is also not a problem on this island, as there are eateries, fast food outlets and restaurants peppered throughout the island. For the beach enthusiast, there are three beaches that can be found on Sentosa – Palawan Beach, Siloso Beach and Tanjong Beach. 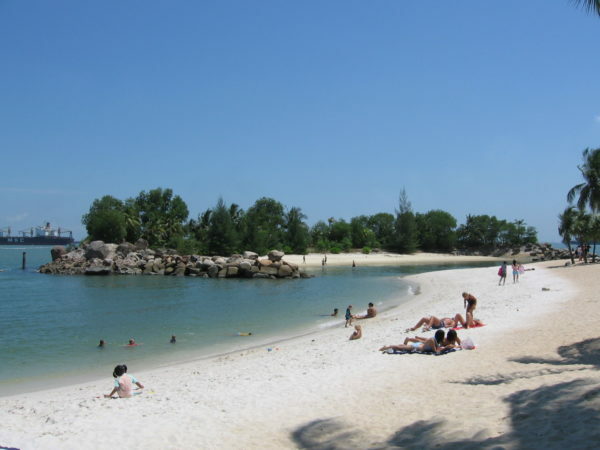 Siloso Beach is known as the ideal location for beach volleyball and other outdoor activities (canoeing, skim boarding, or rollerblading etc), whereas Siloso Beach is more secluded and occasionally used for special events or parties. 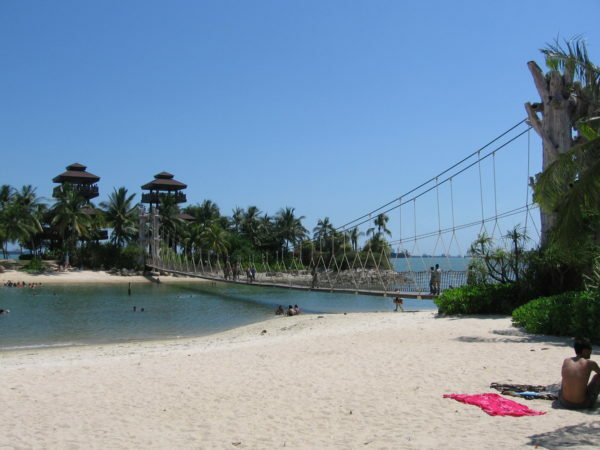 Palawan Beach would be the most popular with several bars located along this beach offering food and beverage, and has a suspension bridge that links beach-goers to the Southernmost Point of Continental Asia. Its location makes it easy for visitors to visit other island attractions like the Carlsberg Sky Tower, Sentosa Luge & Skyride, Butterfly Park, Sentosa 4D Magix and Cineblast easily as they are all within walking distance from Palawan Beach. Another popular attraction held at the Palawan Beach is Songs of the Sea show, which replaces the 25-year-old Musical Fountain show. Fort Siloso is ideal for those looking for a bit of history; it was built in the 1880s by the British to guard the western entrance to Keppel Habour. Wax figurines – replicas of British soldier and other people – together with a display of artillery guns, guns, photographs, documents and flip clips allow visitors to catch a glimpse of what life in the fort was like in the past. Underwater World and Dolphin lagoon are amongst the popular attractions on Sentosa, these two attractions are located side by side. Being an oceanarium, Underwater World has over 2,500 marine animals of 250 spices and allows visitors to view the vast variety of marine life along an 83 metre long travellator, through a submerged glass-windowed tunnel. Visitors are also able to dive with the sharks, but it does not come cheap and requires booking in advance. Dolphin Lagoon, home to some Indo-Pacific Humpback dolphins (also known as the pink dolphins), allows visitors to enter the waist-deep pool and interact with these lovely creatures. There is also a “Swim with the Dolphins program” which allows visitors a closer interaction with the dolphins, and like diving with the sharks it does not come cheaply and requires booking in advance. For those who just want to relax or wan to look for a place to stay, there are spas and 5 star hotels located in Sentosa as well. And with the upcoming integrated resorts, Sentosa is definitely one of the stops you have to make when you are in Singapore!